Analysis of tiny particles has confirmed that dust blown over from the Sahara caused the sun and sky to appear red in many parts of England. Scientists at the University of Nottingham studied dust particles brought down in rainfall to determine the cause of Monday's phenomenon. The dust was dragged in from the Sahara by the remnants of Hurricane Ophelia. Dr Beth Steer collected samples from her car windscreen and put them under a scanning electron microscope. "I was able to collect the dust from my car due to the rain which mingled with the dust to create the muddy rain that has coated everyone's car yesterday," said Dr Steer, from the university's Nanoscale and Microscale Research Centre. 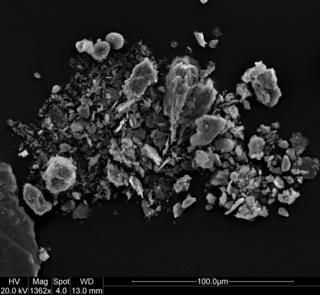 "The particles themselves contain sand grains [quartz], clays and feldspars - all of which are expected in Saharan dust." There were also suggestions the red sky was partly caused by debris from forest fires in Portugal and Spain. However Dr Steer said she would "have to be inconclusive on that one". "It's possible that some of the carbon rich material I saw was originating from the forest fire, but it is more difficult to diagnose," she said. "I didn't see any clear pieces of charred wood or similar. Though I did see flakes of carbon, these could also have come from a variety of sources not linked to the fires." Image caption Dr Beth Steer said the particles are all "expected in Saharan dust"
"I thought it would be informative for people to know what was causing the phenomenon and of interest to see it on a micron scale," said Dr Steer. The scanning electron microscope uses a beam of electrons to create an image of a surface rather than light. This allows things to be seen at much higher magnifications than they could by light. Ophelia originated in the Atlantic where it was a hurricane and as it tracked its way northwards it dragged in tropical air from the Sahara. The dust caused the shorter wavelength light (blue, violet etc) to be scattered away, leaving the longer wavelength light (red/orange) to shine through. Hundreds took to social media on Monday to share their theories and snaps of the unusual red sun and yellow skies. Trending alongside #redsun, #yellowsky and #orangesky was the hashtag #apocalypse.